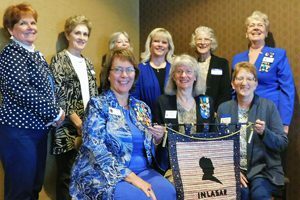 The Indiana Ladies Auxiliary Sons of the American Revolution assists the Indiana Society Sons of the American Revolution with programs, fund raising, historical education and carrying out its mission of inspiring patriotism and informing others of the contributions of our patriot ancestors. Membership in the Auxiliary is open to women related by marriage or bloodline to members in good standing or members deceased while in good standing of the SAR. The Auxiliary meets three times a year during the Indiana SAR House of Delegates meetings, enjoying a short business meeting and program. For additional information, please contact the Auxiliary president. To join the Indiana Ladies Auxiliary Sons of the American Revolution, please use this membership form.